Cook bacon in large nonstick skillet over medium heat until crisp. Remove bacon from skillet; drain on paper towels. Set aside. Remove and discard all but 2 tablespoons bacon drippings from skillet. Add chicken to skillet; sprinkle with salt and pepper. Cook 4 to 6 minutes or until browned, turning once. Move chicken to one side of skillet. Add mushrooms and onion; cook and stir 3 to 4 minutes or until tender. Reduce heat to low; add brandy. Cover; simmer 10 to 15 minutes or until chicken is fork-tender and juices run clear. Remove chicken from skillet; place on serving platter. Cover to keep warm. Add sour cream to same skillet; cook over low heat until thoroughly heated, stirring constantly. Spoon part of sauce over chicken. Sprinkle with bacon and chives. Serve with remaining sauce. Brandy is a liquor distilled from fermented fruit juice. Armagnac is brandy made from grape juice, and Calvados is brand made from apple juice. A small amount of brandy provides balance to this rich chicken recipe. A fortified wine, such as Marsala, port or sherry, can be used in place of the brandy in this recipe. Fortified wines are wines with brandy or another liquor added to them to increase their alcohol content. 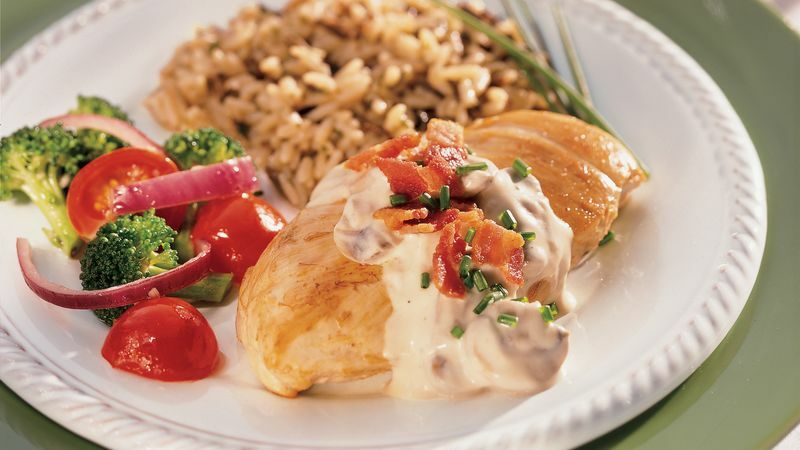 Serve this chicken recipe with a wild and white rice blend. Broccoli florets and a sliced tomato salad complete the menu.